Betty is a chronic pain patient. Betty’s condition is untreatable and degenerative. Her Pain Clinic was closed several years ago and it’s replacement is a joke. Betty cares a great deal about the NHS. Through a good friend she became a health activist. Showing up at marches and demonstrations to Save Our Services. 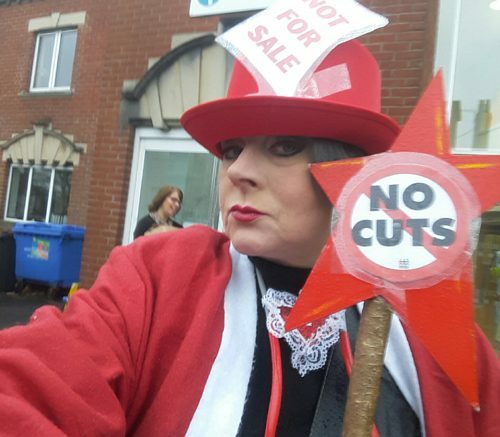 Last December she got on the front page of her local newspaper, proudly holding a sign saying No Cuts! She was good at getting attention. Within ten days of the article, just before Christmas, Betty got a letter. Betty needed to have an out of the blue medical to see if she was better. Merry Christmas Betty. After the holidays Betty went for her medical. The place was empty. A receptionist said they were running an hour late and that she had the right to rebook without effect to her benefit. Betty decided to wait; she had been worrying about it long enough. She spent a long and painful hour wandering around a big empty room unable to sit for more than a few minutes in such nasty chairs. The eventual medical was thorough; humiliating questions about IBS and how often did Betty wash her knickers if she wet them. Does that really matter when you have HMS and spinal and joint OA? It lasted well over an hour. When Betty left, the place was just as empty. A month later Betty received a letter. Her ESA remained unchanged but she had to meet her new Work Coach, Barry. Betty painted and wrote poetry as complimentary therapy and she was showing a lot of talent. Betty was eager to speak to Barry her coach as there was a life drawing course at the local college and she needed advice on charitable funding. Betty had always been helped a lot by the staff at her Job Centre, going home with armfulls of leads for funding and other useful advice. Two days before her appointment Betty’s Dad died and was cremated the day after as is the custom in Spain. Betty was unable to get to the funeral and was too distraught to try to cancel her appointment with Barry. Could she prove her father had just died? Betty decided to be brave and just get through it. On arriving at her appointment she told Barry what had happened with her Dad and that she would do her best with the interview. To save time at the meeting she had printed off paintings she had done and shown Barry the kind of work related activity she had been gladly doing until then. She was keen to do the college course. Barry was not like any coach she had ever had before. He looked up and said “ I am your coach now. I will decide what kind of work related activity you will need to do. I will draw up your action plan and you will do it.” Betty had been recently watching the TV remake of Roots and realised that he was telling her that he was her new master. She broke down into floods of tears and asked to rebook her appointment. Seeing Betty in so much distress Barry opted to demand to know what it was about the interview that had led to her decision. Betty fled the room in tears. She didn’t get far and collapsed and slid down the wall onto the hallway floor in a complete emotional breakdown. Her wailing alerted the security guard who had witnessed the entire interview and a lady from a nearby office. They helped poor Betty up and took her to another department to file a complaint and ask for a different coach. Some how she got home. Betty had a cup of tea and calmed down but that dehumanising experience demanded action. Betty will never talk to Barry again. Precautionary advice is health activists should watch their backs. Be the first to comment on "The Precautionary Tale of Betty Stogs – Health Activist"